This is the most important service of the year, and no one wants to miss it! At midnight all lights in the Church are turned off and all the candles put out. 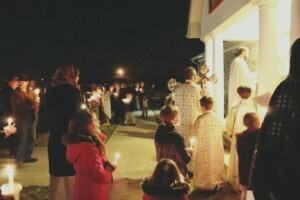 The priest comes out with a single candle while singing “Come receive the light from the light that is never overtaken by the night, come and glorify Christ risen from the dead.” Everyone lights a candle from this light, and we process around the Church. There we hear the greeting ‘Christ is Risen!’ for the first time and reply, ‘Indeed He is Risen!’ After the service, the priest blesses our Easter baskets, and we go to the parish hall to find tables sagging with every kind of good food, and we celebrate together until quite late. Everyone is welcome to the feast! Children are welcome to sleep during the late service.